In lieu of flowers memorial donations may be made to the American Diabetes Association or the Wounded Warrior Project and left at the funeral home. 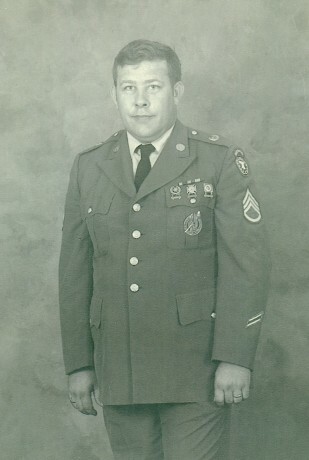 Shelby Lee Hutchison, age 74, of El Dorado Springs, passed away Saturday, April 4, 2015, at the VA Hospital in Fayetteville, Arkansas. He was surrounded by his family and sister. Shelby was born October 30, 1940, at Appleton City, Missouri. He was the oldest son of eight children to the late Glenn Hutchison and Thelma (Key) Hutchison. Shelby attended El Dorado Springs Schools and also college for two years at University of Missouri. Shelby married Vickie Bruce on May 3, 1965. They were married 13 years and to their union three children were born. He lived his whole life in El Dorado Springs except for his time spent in the Army. He helped his parents on their farm, had a milk route, worked and retired from 3M and also owned his own construction company. He loved to spend time with his family and gardening. He also loved his St. Louis Cardinals baseball team. He was a hard worker and always was there to lend a helping hand to his family or friends. Preceding Shelby in death were his parents; Glenn and Thelma Hutchison; two brothers: Tom Hutchison and Robert Hutchison; and a special aunt, Georgia Baldwin. Survivors include his three children: Melissa Flippo and husband Bobby Flippo Sr. of Bella Vista, Arkansas; Randy Hutchison and Tina Duenow of Des Moines, Iowa; and Michelle Pointer and husband Sergeant First Class Ronald Pointer of Cabot, Arkansas; six grandchildren: Ryan Berning; Jayme Thompson and husband Jared; Blake Gibbs; Tori Gibbs; Tannon Gibbs and Bobby Flippo Jr.; four great-grandchildren: Bry Thompson; Maci Berning; Ryan and Landyn Butler; one sister and four brothers: Carolyn Jones; Bud Hutchison; Jim Hutchison; Terry Hutchison and John Hutchison. The family will receive friends Thursday, April 9, 2015, from 6:00 to 7:00 p.m. at Bland-Hackleman Funeral Home. Funeral services for Shelby Lee Hutchison will be held on Friday, April 10, 2015, at 11:00 a.m. at Bland-Hackleman Chapel with Rev. Stanley Vilhauer officiating. Military services will follow at Mt. Pleasant Cemetery under the direction of Bland-Hackleman Funeral Home. Pallbearers are: Steve Jones; Ryan Berning; Blake Gibbs; Tannon Gibbs; Bobby Flippo Sr. and SFC Ronald Pointer. Honorary pallbearers : George Jones; Bud Hutchison; Jim Hutchison; John Hutchison; Terry Hutchison; Jerry Baldwin; Randall Baldwin and Kendall Gibbs.